For the past 6 weeks — since we first started attending the Windsor farmer’s market — we’ve made more money each subsequent weekend, because we’ve brought more (and a greater variety of) produce each time. Every weekend, we sold out of our pre-bagged baby red-and-green leaf lettuce mix before the market closed. We kept telling ourselves, Gosh, we really need to bring more! It started yesterday, Saturday, at the Healdsburg market. Now last weekend we brought several harvest-tubs full of Bright Lights rainbow Swiss chard to the Healdsburg market, and sold every bunch but one. This weekend, we brought the exact same amount of the exact same quality produce, and we sold maybe 1/3 of what we brought. Then came today. For the first time, we were prepared for our red-and-green salad onslaught. 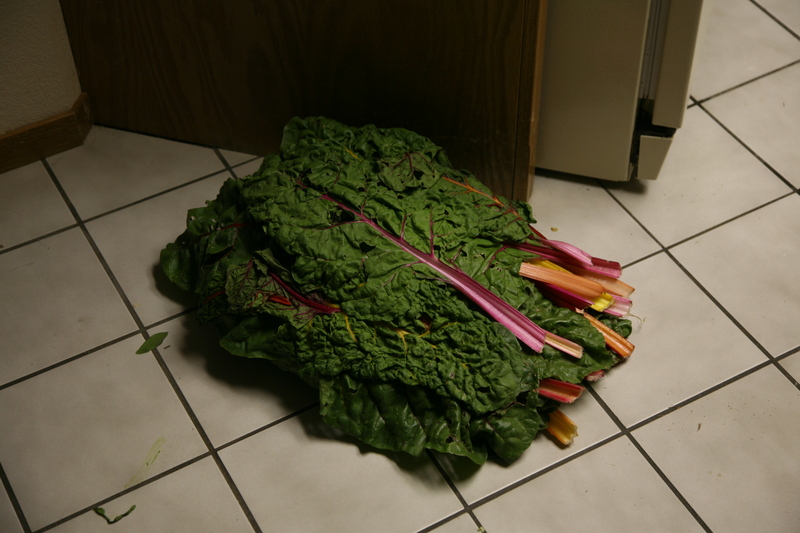 We brought 49 bags of the lettuce mix…. …And sold considerably less than we’d sold in previous weeks. At the end of the day, we had a bit under thirty bags left. We drive-by lettuced fellow sellers at the farmer’s market, giving away $3 bags of salad mix to neighbors, volunteers, and people we’d never met before. Still, it was depressing: all that lettuce bed weeding and early-morning-snipping-and-bagging and hoped-for income just disappearing into thin air. To make matters worse, it was just one of those days. Over the course of my 14-hour workday, I stubbed my toe twice. I slammed my finger between a car door and a support beam. I whacked my head getting into the pickup truck. Even caffeine couldn’t seem to rouse me from my stupor. And the insult on top of the injury: I’m pretty sure that today I made the same amount of money as the young girl with the lemonade stand at yesterday’s farmer’s market. How do I know this? Having sold out of her lemonade, the little girl walked by our stand to bring 10% of her day’s earnings to the manager for her stall fee. (It was an adorable sight, and even without knowing her, I felt proud of her.) Clutched tightly in her little hand I could make out a $10 bill and several ones — less than I paid to the market manager yesterday, but about what I paid to the market manager today. This, despite the fact that we don’t have a scale and do have a sign posted with fixed prices for “small” and “large” zucchinis. We price the really small zucchinis higher than $1/pound, because they’re more tender, are tasty eaten raw, and are harvested as a special item, sometimes with blossoms attached. There’s an opportunity cost associated with these guys: we could let them grow into ginormous one-pounders and get our money’s worth out of each female blossom, but we like to offer customers a variety. It seemed a little absurd to watch the woman walk away with 6 beautiful, perfect baby zucchinis (a couple with still-fresh, edible blossoms!) for a dollar. At that price, it isn’t really worth my effort to harvest them, let alone grow them. But honestly, we were too tired to fight it. And $1 is better than nothing… although I’m not so sure about that, actually. Sometimes dignity is better than $1. Sigh. We got home after 7 p.m., having left the house in the 5 a.m. range. We cooked our classic Sunday dinner, which is (if it isn’t burritos from the local Mexican joint because we’re too pooped to cook)… drumroll… whatever’s left over from the market! Over our dinner of market leftovers (lots of salad!) we discussed ways of genuinely making money as a farmer. I’ll keep you updated if any actually work. Now, it’s time for bed. As always, tomorrow’s a new day.